Silent Run offers drift trips and walk-in trips for the Alaska King Salmon. The season opens in mid May until July 31. 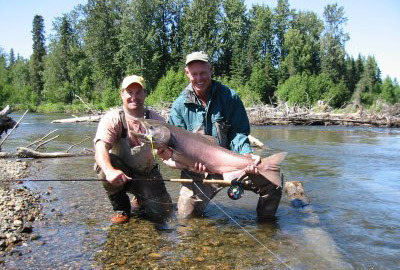 We fish both the large Kenai River and the small clear water streams of the Susitna River Drainage. This trip is recommended for clients with good casting skills and fish fighting ability. Silent Run will supply you with Sage 12 to 14 weight rods and Ross Big Game Reels. The line we will be using is Rio sink tip line from 200 to 1150 grain in order to hook and handle Kings from 20 to 60 pounds. Dates to fish King Salmon are limited, please call ahead to book your reservation early.